Reporting is hands down one of the most terrifying parts of a marketer’s job. All our hard work, brilliant ideas, and nervous campaign executions are exposed, and we have to come to terms with the essential question that keeps us all employed… Did it work? Marketers employ a strange version of the Scientific Method. Equal parts science and art, we gather as much data as we can, come up with a wacky new concept, and throw it all against the wall to see what sticks. We form good hypotheses and try bold new things. Lather. Rinse. Repeat. It can be daunting to go through this process over and over, month after month, quarter after quarter. Having to look forward AND backward at the same time can be exhausting. Which is why we’re taking it down to the studs so maybe, just maybe, you don’t feel all that 4th quarter pressure this year. The Success Report – This report has a start and end date, measures performance over a defined length of time, and clearly and cleanly answers one single question: Did we achieve the goal we set when we began this campaign? The Performance Report – This report measures campaigns that are currently in flight, and seeks to determine whether we are on track to meeting our previously stated goal. Marketo makes this so easy! 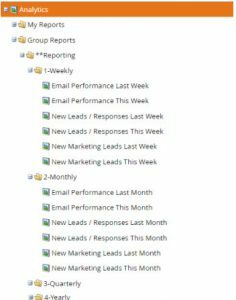 Here is a common foldering structure I like to use in the Analytics section of Marketo where every folder here has the exact same report, just with a different date range. Defining your organization’s KPIs doesn’t have to resemble the rebuilding of a house. Use some of the above steps to help remodel what makes the most sense. Good luck remodeling and making the most out of the 4th quarter!